Income Percentile Calculator for the United States. What Percent Are You? This income percentile calculator contains 2017 income brackets for the United States for all individual earners in the workforce. Enter an annual income and we’ll estimate where it fell in US income brackets. Data is from the March 2017 Current Population Survey, and income data is full-year 2016 (Jan to Dec). Want more? We have an income bracket article. By age, we have an individual income by age calculator. For households see the income by household calculator. For net worth, we have a net worth bracket calculator and a net worth percentile by age calculator. Notes: The income percentile calculator has a logarithmic scale by default, but you can turn it off with the included checkbox. For investments such as angel investments, private equity funds, venture capital, hedge funds, the real estate crowdfunding platform RealtyShares, and others an investor has to be Accredited. One of the ways to achieve the designation is through income: either $300,000 annually as a household or $200,000 as an individual for the previous two years (with the promise it will continue). In America it is more common for Accredited Investors to meet the net worth criteria of $1,000,000 outside a primary home, although a fair number of households qualify on affluence alone. See our calculations on the number of accredited investors in America. Who Are the 1% in America in 2017? Earning $300,800 or more full-year 2016 would put a worker in the top 1%. (This is up from $288,000 last year). Can you make a .1% estimate? Public microdata from the CPS is screened and topcoded, so data falls off at the top end. While the income percentile calculator above will give you an answer, $1,099,999, please note that as a result of the above this is not a great estimate. Please consider that there is significant – and incalculable (at least publicly) – error around the top .1% of earners. See our American income brackets article for full methodology including our workforce screen. The data comes from United States Census Bureau’s ASEC, released September 2017. The University of Minnesota’s Minnesota Population Center harmonizes data across years and variables. Income is all income earned from all sources (including salary and home businesses), see this full definition. A note on accuracy: CPS data introduces some inaccuracy compared to IRS reported income numbers. Additionally, as noted in the 1%er section, IPUMS topcodes and screens the income data to protect the privacy of survey respondents. Usually, the highest income earners are easiest to identify, so most screened data points come from the top of the set. As with our other calculators, note that information is acceptable for most reasons you’d use this tool. Data is for comparison purposes or informational purposes only. How Many Americans Made Between $200,000 and $300,000? As we mentioned in the net worth percentile calculator, we often get questions of the form ‘how many people made between ___ and ___‘? We’ve exposed the approximate number of workers that were in selected income brackets in this tool so you can do that type of math. 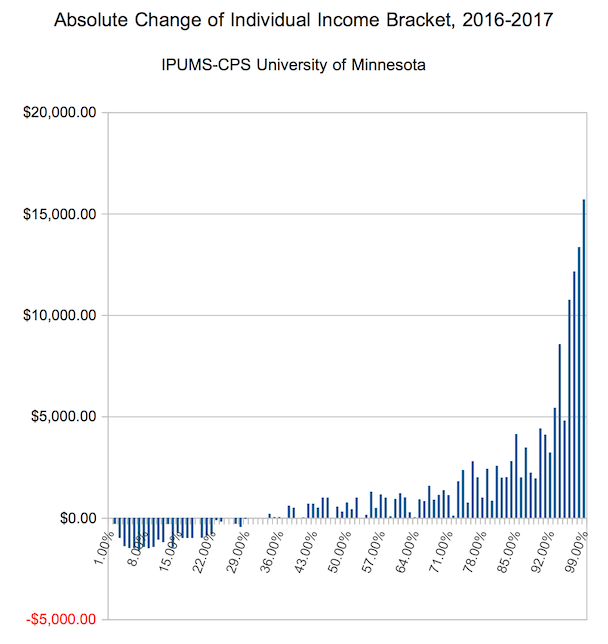 $200,000 in income is near the 97.4% in America (the tool starts the bracket at $200,001, so add a dollar). Roughly 4,479,896 made $200,000 or more in full-year 2016. An income of $300,000 approached the 98.9% in 2016. 1,895,340 workers pulled down $300,000 or more in full-year 2016. 4,479,896 – 1,895,340 = Roughly 2,584,556 people made between $200,000 and $300,000 in full-year 2016. 98.9% – 97.4% = 1.5%. Hopefully this will help you to answer these types of questions quickly for this year’s data. What Did We See in This Year’s Income Percentile Data? Due to much feedback about properly evaluating the size of the American workforce, this data isn’t perfectly comparable to last year’s calculator so the numbers below were recomputed. Also, note that either way the survey isn’t longitudinal; you can’t draw conclusions about individual workers from this static shot, merely about the bracket as a whole. That’s an excellent result holistically, with gains accruing across the spectrum. The data even included an additional ~5,000,000 extra workers in the workforce for this screen over the previous year, a nice increase in participation.